An invisible form of radiation, UV rays pelt your retinas at 186,000 miles per second. Eye damage linked to UV includes cataract, photokeratitis and pterygium. UV damage builds up over time. You generally don’t feel UV rays, so there is no natural warning that damage is being done. And although clouds reduce the level of UV reaching your eyes, clouds don’t block UV completely — which means your eyes can be exposed to UV rays even on overcast days. UVA is lower in energy but penetrates more deeply than UVB. UVB is a high-energy ray that causes the most damage to eyes. UVC is the most powerful form of all. Most eyewear lenses block some UV so they can claim “UV protection” but Venths’s SVO lens material filters out 100% of all UVA, UVB and UVC. The protection is built into the lens material so it can’t scratch off and leave your dilated pupils exposed to a UV leak. Harmful blue light rays are known as High Energy Visible (HEV) wavelengths. HEV light has been linked to several forms of eye damage. 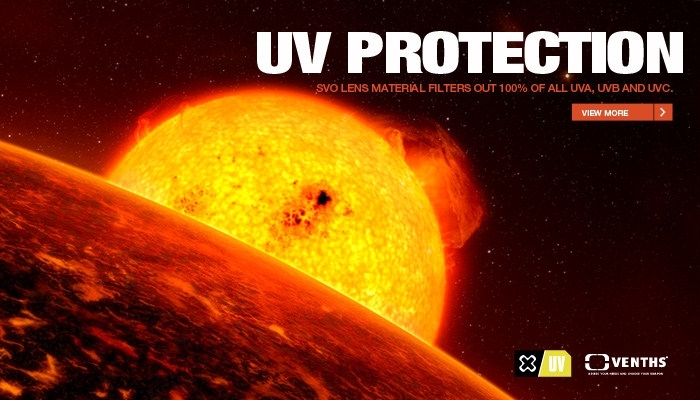 That’s why our SVO lens material is engineered to block 100% of all harmful blue light up to 400 nanometers. In addition to protection, this is a performance benefit because blue light rays are a major factor in glare.